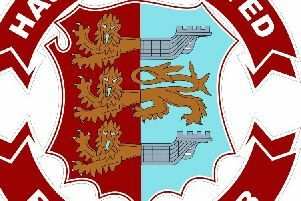 Chris Agutter said his Hastings United Football Club players did everything that was asked of them in Saturday’s unfortunate defeat. Hastings lost 4-2 at home to Bostik League South East Division play-off rivals Haywards Heath Town, despite dominating the match. Agutter said: “I thought we were very good actually, completely dominant and they’ve somehow scored four goals. It’s a weird one really, because I feel like the players followed the game plan to a tee. Hastings twice came from behind to equalise through Daniel Ajakaiye, but two goals in the final 10 minutes consigned them to only their second home loss of the season. “The first goal is one of the best team goals we’ve scored all year,” Agutter continued. “Dicko (Jack Dixon) picked the ball up in a great area, played a great ball through and Daniel finished it. Agutter also felt Hastings ought to have been awarded a free kick for a high Haywards Heath foot in the build-up to the visitors’ third goal. “It is (a free kick), but I can’t speak about referees any more because they’re not very good,” he went on. “When their centre-forward kicks your centre-half in the head, normally it’s a high foot.